Conext XW+ Power Distribution Panel | Schneider | B.O.S. | DNM Solar Solutions Inc. The ConextTM XW+ Power Distribution Panel (XW+ PDP) is factory-wired and labeled to support the integration of multiple Conext XW+ inverter/chargers and Conext MPPT Solar Charge Controllers with a single battery bank. The XW+ PDP ships with breakers, bus bars and cables to install a single XW inverter/charger. 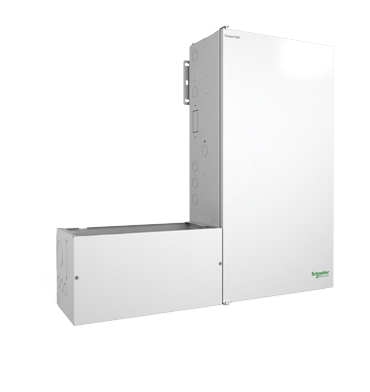 With space to add wiring and breakers a single XW PDP supports one to three XW inverter/chargers, a diesel generator and either four MPPT 80 600 or four MPPT 60 150 Solar Charge Controllers. The XW PDP supports single-phase, split phase or three-phase installations. The XW Power Distribution Panel is designed to save significant time and money during installation, when compared to custom solutions.